This past week was an interesting week in the NFL, we had some big players not play due to injury, some bad play calling cost teams the win, and a major referee blunder at the end of a game which cost a team the opportunity to win the game with a fist-down on the 1-yard line. I went 11-4 last week, which easily could’ve been 13-2 had some things worked out as they should’ve. 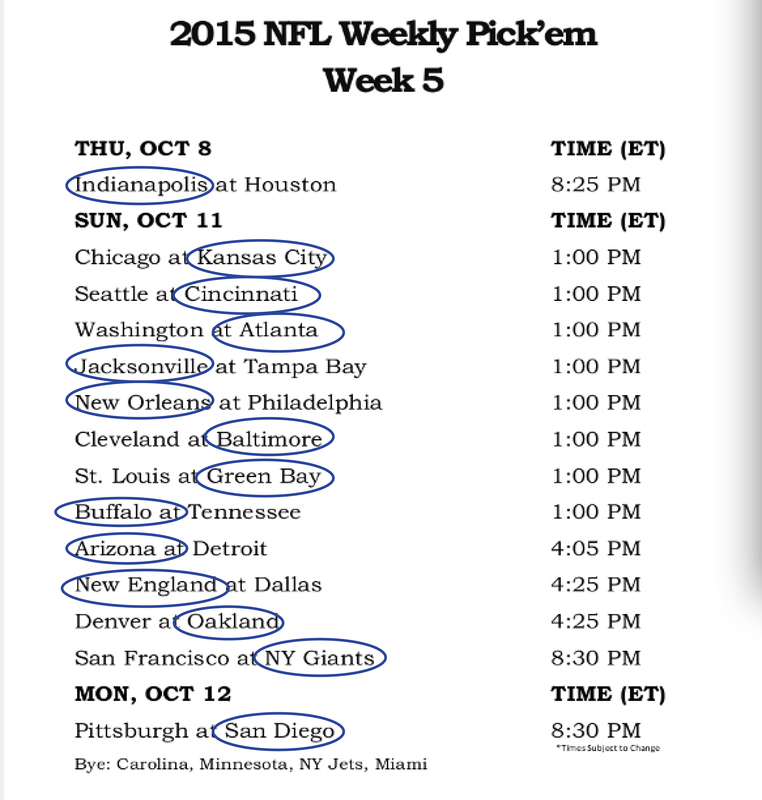 I feel pretty confident in my weeks picks, and yes, I did not make a mistake when I chose Oakland to beat Denver at home. I feel Denver is the most-overated team in the NFL this year. Denver is Oakland’s #1 rival. Forget the team across the bay, it’s Denver- they hate each other. Oakland’s play has been respectable this year and beat the Ravens a few weeks ago at home. Guess what, the Broncos are coming into The Black Hole and may not come out the other end without a L beside their name. Denver easily could be 1-3, if it weren’t for Steve Smith not catching a TD at the end of the game, or Jamaal Charles fumble in week 2 and barely beat the miserable Lions (and it came out after the game they knew all the Lions plays). Look for Oakland to bring everything they have for this game, it’s essentially their Super Bowl for the year. UPSET!!! This week’s top plays, let’s go. There are some interesting match ups, some where I think some players will have the opportunity to really shine. Tom Brady @ Dallas. Tom and Aaron are currently leading a 2-horse race for MVP this year. Brady and Co. had an extra week to prepare for the Cowboys. The Cowboys are coming off an emotional loss. All signs point to a big game from Handsome Tom. Drew Brees @ Philadelphia. Kirk Cousins was able to have his way with the Eagles last week and he is nowhere near the QB Drew is, even if he isn’t 100 per cent. The Saints want to keep pace with the Falcons and Panthers in the, suddenly strong, NFC South division. Look for Drew to put up some big numbers this week. Philip Rivers vs. Pittsburgh. The Chargers struggled last week without some of their big boys up front missing. They should be back this week. The Steelers have allowed teams to throw over the top of them all year and Rivers is one of the league’s best pocket passers. Matt Forte @ Kansas City. The Chiefs run D has been run over the last two weeks. The Bears actually looked like a half-decent football team last week and Forte was a big reason for that. The matchup in KC favours Forte greatly. Le’Veon Bell @ San Diego. The Chargers allowed the Browns RBs to have a big day, Bell is a beast and is extremely tough to stop. My only worry is the Chargers may load up the box with Vick still manning the helm behind centre. Bell still should get you, at least, 1 TD and 125 all-purpose yards. T.J. Yeldon @ Tampa Bay. The rookie is set to break out this week against the Buccaneer D who seemingly lets any in the NFL run on them. Expectations were high coming into the season, he finally delivers this week in Tampa. 1.Keenan Allen vs. Pittsburgh. As mentioned earlier, the Steelers secondary has been torched this year. Allen has been playing very well lately and is unstoppable in certain circumstances. Look for Rivers and Allen to connect at least 12 times this game. 2. Antonio Brown @ San Diego. The Chargers had trouble stopping Josh McClown (sp) last week. Albiet, Mike Vick isn’t the QB he was in the mid 2000’s but he can still get the job done. Brown returns in a big week this week. 3. Julian Edelman @ Dallas. One of New England’s biggest weapons against opposing teams is bound to have 15 catches this week along with 2 TD’s. No need to say more, just watch and see. PPR monster this week. Rob Gronkowski @ Dallas. The only way I see a team stopping Gronk on the goal line is if they play Houston and put J.J. Watt on him. The man is unstoppable and Dallas has no one who can cover him after losing their best defender last week. Travis Kelce @ Chicago. It’s no secret the Bears have had trouble covering TE’s this year. Kelce is one of the league’s best and Alex Smith’s safety valve. Everybody knows KC receivers don’t score touchdowns, so someone has to, no? Zach Ertz vs. New Orleans. Ertz has been a letdown so far this year, but has a VERY favourable matchup against a saints team that has been very shaky against tight ends this year. Look for Ertz to have a solid week. Arizona. They are the league’s best defence. Detroit has a horrible offensive line that gets 0 movement and doesn’t allow Stafford the time he needs to get the ball to Megatron. Megatron will be doubled all game. This game will be ugly and over by half time. Calling it now. Andre Johnson @ Indianapolis. Look for Johnson to trade in his walker for a few looks in the end zone this week. Reports say he has been extremely focused all season for this matchup against the team who let him walk. He is too much of a pro to not take that slight. Whoever is starting for the Colts at QB is going to find Johnson in the end zone…BOOK IT!